Not far from the New Fulton Fish Market in the Bronx neighborhood of Hunts Point, Christopher Toole is doing a little fishing of his own. Leaving behind a life of financial planning, Toole and his girlfriend Anya Pozdeeva have set up shop as urban fish farmers. Dozens of 50-gallon plastic recycling bins make up the couple’s fish farm, where they are raising tilapia and other fish. The fish are part of a small urban farm at a Bronx Community Center, where an herb garden is fertilized by the fish’s waste. Feeling disillusioned by the banking industry, both Toole and Pozdeeva left their financial jobs in hopes of raising fresh organic fish right here in the Bronx. 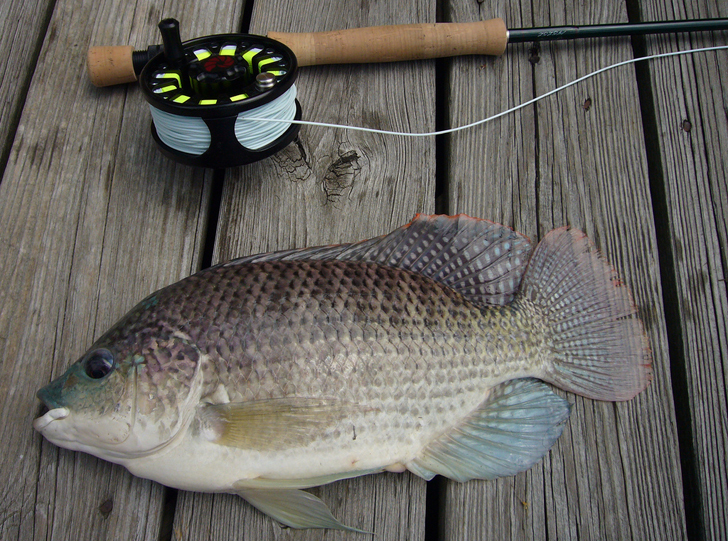 The tilapia, which Toole nicknamed “Bronx Best Blue Tilapia,” was chosen for its high protein content and easy breedability. The fish swim around the couple’s aquaponic tanks, which were first installed in their Riverdale apartment. for Aquaponic Values and Education. Here, the tanks are part of a small urban farm. The fish waste helps fertilize adjacent herbs which thrive in a separate bin. Toole and Pozdeeva enlist the help of local children to change tanks, and learn the inner workings of the fish farm. Community education is one of the couple’s goals, believing firmly in the old adage of teaching a man to fish and he shall eat for a lifetime. Toole hopes to teach area families in need how to raise their own healthy food right in their urban apartments, giving them a sense of accomplishment and less dependence on government funded support. Toole plans to create a network of restaurants, farms, and other people like himself who will all raise urban fish, creating a small, sensible market for it. The farm has thus far yielded 500 tilapia which have been sold or given away. This simple business plan can help start a cycle for Bronx families to not only eat healthier, but to be able to eventually raise food for their own kitchens. Hi, I need expert advice on how to start up a Tilapia fish farm from scratch. Am from Ghana. Thank you. Please visit WorldWide Aquaculture for great information on fish farming. I believe the tanks pictured above are WAY bigger than 50 gallons. A rain barrel is 50 gallons. These are likely 500 (10 rain barrels) or maybe even 5000 gallon size tanks. I think this is an incredible idea It would be really good if it could be done in this country. And I understand Tilapia is a very tasty fish..
Not far from the New Fulton Fish Market in the Bronx neighborhood of Hunts Point, Christopher Toole is doing a little fishing of his own. Leaving behind a life of financial planning, Toole and his girlfriend Anya Pozdeeva have set up shop as urban fish farmers. Dozens of 50-gallon plastic recycling bins make up the couple’s fish farm, where they are raising tilapia and other fish. The fish are part of a small urban farm at a Bronx Community Center, where an herb garden is fertilized by the fish's waste.